It's been on hiatus for a bit while Hicks works on other projects, but The Adventures of Superhero Girl remains one of my favorite webcomics. 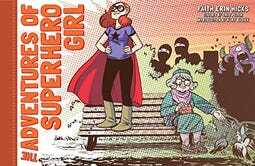 It's about a fledgling superhero (with a famous, beloved older brother) trying to find her way in the world, including making rent and remembering to take off her mask when she's in her street clothes. Hicks draws great parallels between superheroing and other "do what you love" careers (like cartooning), but doesn't let the allegory overwhelm the fun of ninjas, space aliens, and that cute but obnoxious guy SHG decides is her nemesis. 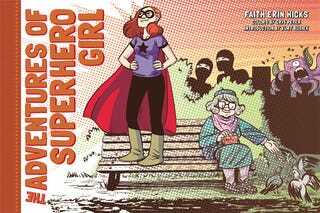 It's not available on Amazon quite yet (although you can preorder it), but Dark Horse just released a print version of The Adventures of Superhero Girl in color! Woo! It has already popped up at comic book shops this week, and it's available from Things From Another World.